Stickers and patches with themes related to famous characters, such as the Simpsons, the characters from the movie Cars, Heidi, Asterix, Minions and more. Product Description: Sticker (patch) with an embroidery of the character Heidi and a little bird in blue (Pichi).Content: 1 iron-on stickers.Maximum Length: 85 mm.Material: Textile. 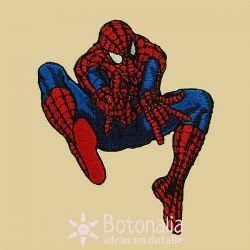 Iron-on sticker (patch) with an embroidery of Spider-Man.Content: 1 iron-on sticker.Dimensions: 70 x 50 mm.Material: Textile. Sticker (patch) with an embroidery of Rayo McQueen, character from the movie Cars.Content: 1 iron-on sticker.Dimensions: approx. 35 x 80 mm.Material: Textile. 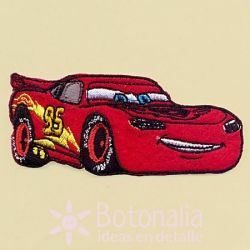 Product Description: Sticker (patch) with an embroidery of the character Mate, from the movie "Cars".Content: 1 iron-on stickers.Dimensions: 68 x 90 mm.Material: Textile. Sticker (patch) with an embroidery of a character of the movie Minions.Content: 1 iron-on sticker.Dimensions: approx. 50 x 68 mm.Material: Textile. Product Description: Sticker (patch) with an embroidery of the character Bob the BuilderContent: 1 iron-on stickers.Dimensions: 70 x 50 mm.Material: Textile. 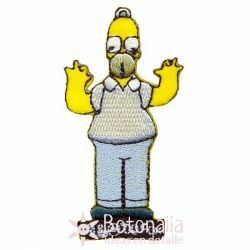 Product Description: Sticker with a design of Homer Simpson.Content: 1 iron-on sticker.Maximum Length: 70 mm.Material: Textile. 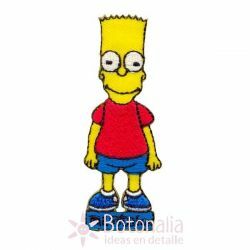 Product Description: Sticker with a design of Bart Simpson.Content: 1 iron-on sticker.Maximum Length: 69 mm.Material: Textile. 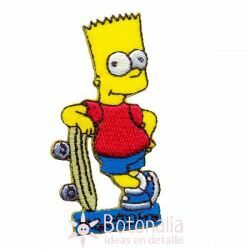 Product Description: Sticker with a design of Bart Simpson.Content: 1 iron-on sticker.Maximum Length: 66 mm.Material: Textile. 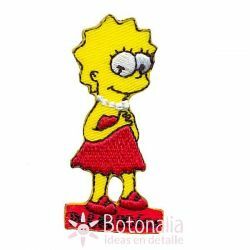 Product Description: Sticker with a design of Lisa Simpson.Content: 1 iron-on sticker.Maximum Length: 60 mm.Material: Textile. Product Description: Sticker with a design of Lisa Simpson. Content: 1 iron-on sticker. Maximum Length: 53 mm. Material: Textile. Product Description: Sticker with a design of Lisa Simpson playing saxophone.Content: 1 iron-on sticker.Maximum Length: 60 mm.Material: Textile.